Pink Peacock Boutique’s Grand Opening April 25th! Pink Peacock Boutique, a brand new shop in West Chester, will be hosting their grand opening April 25! Click here to learn all about the grand opening event! 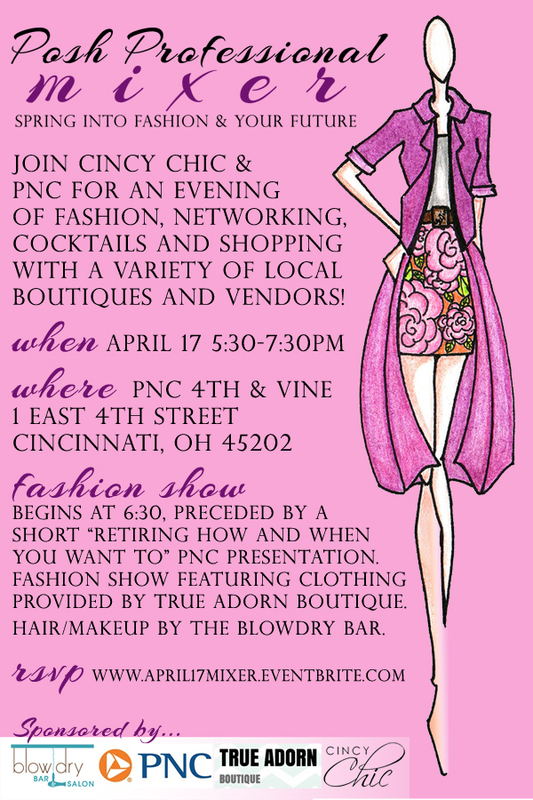 Lucky for you they’ll be offering a sneak peak of their boutique at Cincy Chic’s April 17 Posh Professional Mixer! At the mixer, you’ll get to spring into fashion and your future full of fashion, networking, cocktails and shopping a variety of other boutiques and vendors! The Posh Professional Mixer will be held from 5:30-7:30 p.m. at PNC Bank on 4th and Vine in Cincinnati. Pink Peacock is the first-ever designer Indian Boutique in Cincinnati, featuring authentic Indian clothing and AMAZING jewelry! So, make sure you check out the mixer and her grand opening event to see all of Pink Peacock’s gorgeous goodies for yourself! The fashion show for the Posh Professional Mixer will begin at 6:30 and the event will feature a PNC presentation called “Retiring How and When You Want To.” Clothing for the fashion show will be provided by True Adorn Boutique. Hair/Makeup by The Blowdry Bar. Vendors include: Chapeau Couture Hat Boutique, Pink Peacock Boutique, Stella & Dot with Kelly Patek, Zeal for Life Wellness with Marsha George. Everyone who attends will receive a swag bag full of goodies! Visit Pink Peacock Boutique’s Facebook page to learn more about the grand opening and RSVP for Cincy Chic’s Posh Professional Mixer by clicking here.